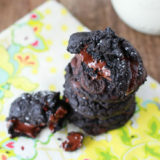 Thick, soft, and unabashedly chocolatey, these deep dark cookies are the best thing to come out of my oven in a long, long time. A little sprinkle of coarse salt gives these ebony gems a sophisticated boost. I love having a food blog. I’ve always adored experimenting with recipes, writing is in my blood, and I’ve been huge into photography since the beginning of time (though for me, food photography is much more of a challenge than landscapes, pets, or portraits). Oh, and I love creating spaces on the web – I’ve been drawn to the internet since its inception, shaping my career first around web design, then development, then focusing more on writing professionally for corporate websites, and then finally, this blog – such a perfect intersection of so much of what I love. But the reason why I brought it up is a little cheaper than everything I listed above. The guilty truth is, I also love having a food blog because it gives me an excuse. 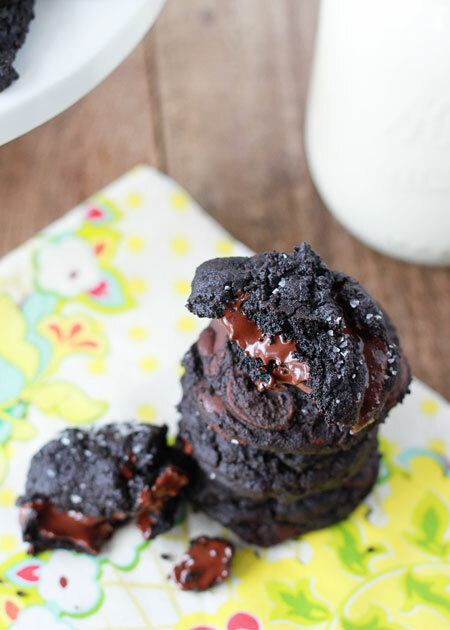 An excuse to make sinful recipes like these salted double dark chocolate cookies. These rich, ebony little nuggets of pure heaven really have no business being in my kitchen other than if I’m going to wrap them up and give them immediately away. Which, luckily, kind of happened … our friend came over shortly after I made and photographed them, and, thankfully, it was his birthday. I plopped a candle in the top of that pile of cookies you see above, and he blew out the candle (several times, actually – it was one of those annoying relighting candles), we each ate one, and I sent the rest home with him. But not before I took many ooey, gooey, chocolate-upon-chocolatey photos of these cookies. And, okay fine, I’ll admit it – not before I had already stuffed several in my face (hey, I had to make sure they were blog-worthy), and not before my guy consumed several of his own, simultaneously uttering words of praise and cursing me for bringing such irresistibleness into our lives. 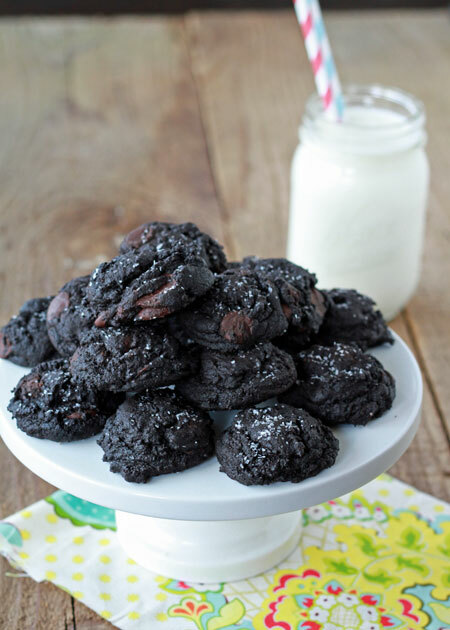 These double dark chocolate cookies have so much cocoa, they’re practically black. Those chips you see there? They’re dark chocolate chips. 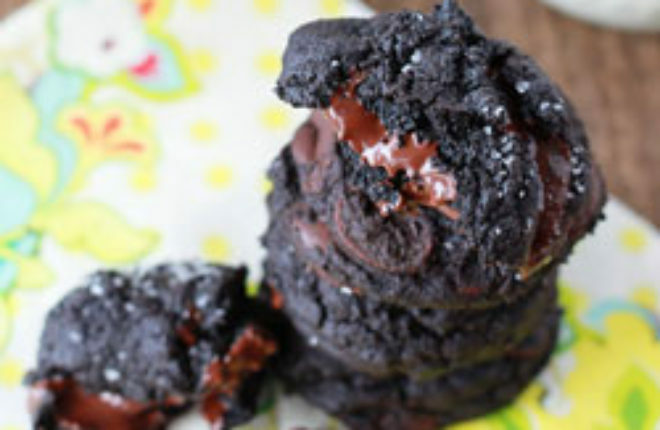 So you can see just how gloriously rich and jet-black these cookies are. I adore the way a little sprinkle of salt amplifies those wonderful heady chocolate notes, so I added simple coarse kosher salt to the dough itself, plus I dropped a little more on top before baking. You can use a fancier sea salt – I just happened to not have any in the house, and kosher salt worked perfectly. The only thing I might do differently next time is add a couple of teaspoons of instant espresso powder to really boost the chocolate flavors. Gosh, more experimenting? I suppose I must. It’s such hell being a food blogger. Heat oven to 350 degrees Fahrenheit. In the bowl of a stand mixer fitted with a paddle attachment or in a large bowl with a hand mixer, beat together the butter, brown sugar, and granulated sugar on medium speed until pale and fluffy, about 3 minutes. Add the eggs one by one until completely blended in, and then the vanilla. In a medium bowl, sift together the flour, cocoa, baking powder, baking soda, and kosher salt. Add the dry ingredients to the wet mixture and beat on low (or stir by hand) until the ingredients are incorporated. Add the chocolate chips. The batter will be very thick. Scoop the cookies in approximately 2-tablespoon increments onto an ungreased non-stick cookie sheet or cookie sheet lined with silpat. I recommend a cookie scoop for this step - makes life so much easier. Bake for about 7 minutes, until the cookies seem set but might still appear underdone (key to a soft, moist cookie). Remove from oven and let sit on baking sheet for about 5 minutes, then move to a wire rack to cool completely. I don’t need an excuse to dive head first into these. Yum! They sound wonderful. Actually kind of close to a similar recipe I often make called Saskatchewan double chocolate cookies. I’m not quite sold on the salt on the top of the cookie thing but I really don’t like salt and hate having to add it to recipes. OMG these look phenomenal! That melty chocolate looks too good to be true. Pinned, and definitely making soon. I always wonder about how people come into blogging, so it was fun reading a little about your backstory. I taught myself HTML when I was 14, back when AOL was pretty much the extent of the internet to most people. I had a website with flashing text–remember flashing text?! Ha, I remember flashing text too! And rainbow horizontal lines. I used a few of those, I must admit. Oh boy. I shouldn’t have made these because I just ate 4 in no time flat! Super easy, and amazing. The salt takes it over the top. Oh my god these things look deadly. I just made these, subbed 60% cacao ghiradelli baker’s chocolate for the cocoa powder (plus a little leftover 100% cacao chocolate) and used a small amount of semisweet chips… plus waay more salt on top… I’m obsessed with salty-chocolate things. LOL – I’ll take the love, and the hate. It’s a good hate! 😉 Those sound fabulous – glad to know the substitution for cocoa powder turns out great. I will have to try it! I made these for my colleagues at work in celebration of “Nurses Week” in Ontario. They were easy to make and so very good! Great recipe will certainly make them again. I’m thinking of making these as part of my annual client cookie gifts, & would love to do them ahead. How long do you think they’d keep? Of course I’ll need to hide them from myself! Yes, I often have to hide cookies from myself! 🙂 They’ll do fine at room temp for 3-4 days (in an airtight container). But they also freeze fabulously; that’s what I’d do! When do you put the salt on top?